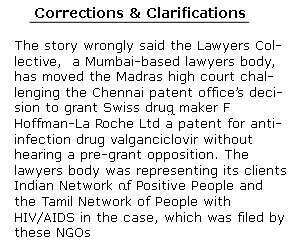 Mumbai: The Lawyers Collective, a Mumbai-based lawyers body, has moved the Madras high court challenging the Chennai patent office’s decision to grant Swiss drug maker F Hoffman-La Roche Ltd a patent for anti-infection drug valganciclovir without hearing a pre-grant opposition filed by the group in December 2006. The lawyers body had filed a pre-grant opposition in the case of Valcyte on behalf of the Indian Network of Positive People and the Tamil Network of People with HIV/AIDS. The drug is widely prescribed for HIV (human immunodeficiency virus) and AIDS (acquired immunodeficiency syndrome) patients, and patent holder Roche sells the drug in India under the brand name Valcyte. Mint had previously reported that Valcyte faces at least five post-grant oppositions, all pending with the Chennai patent office. The current development follows a recent patent infringement case filed by Roche in the Bombay high court seeking an order to stop local drugmaker Cipla Ltd from selling a generic copy of Valcyte launched in January. A ruling on the group’s case will have a direct impact on the Roche versus Cipla case. The Lawyers Collective notes that the Chennai patent office granted the patent in June last year. The group had opposed Roche’s application in 2006 on the ground that the drug has no novelty, which disqualifies it for a patent as per the Indian patent law, amended in 2005. According to US patent office records, valganciclovir was invented by Roche in 1994, and was patented in the US the same year. It was first patented in Switzerland that year. An official at the Chennai patent office had told Mint in an August interview that the office was not required to hear pre-grant opposition as the granting process was completed before the opposition was registered. Anand Grover, project director at Lawyers Collective, had previously maintained that valganciclovir is an important drug for HIV patients and that Roche was charging an exorbitant price. Roche charges about $9,900 (Rs4.85 lakh) for a three-month treatment, although it has reduced the price to $1,800 for NGOs and customers in Africa and some other countries.